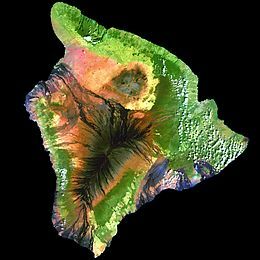 Hawaiʻi (/həˈwaɪ.i/ or /həˈwɑːiː/; Hawaiian: [həˈwɐiʔi] or [həˈvɐiʔi]), is the lairgest island locatit in the U.S. state o Hawaii. ↑ "Summit USGS 1977". NGS data sheet. U.S. National Geodetic Survey. Retrieved August 18, 2010. This page wis last eeditit on 8 August 2015, at 16:10.